Maymay Entrata is Tyra Banks-approved. 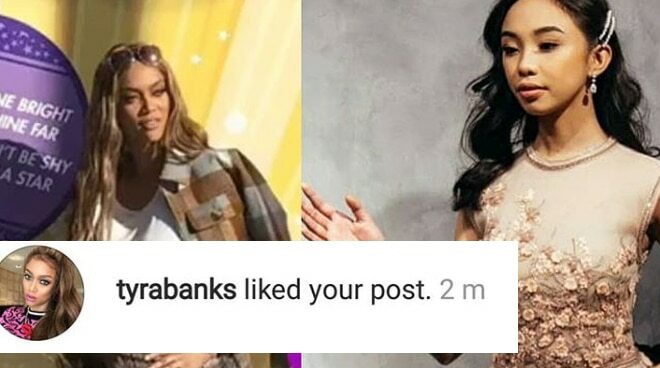 Supermodel Tyra Banks has once again given Maymay Entrata a nod after liking a side-by-side photo of her and the Filipina actress on Instagram recently. The image, a collage made by fan account 'just_love_mayward,' shows Tyra and Maymay doing the same poses in two separate events. As of writing, nearly 800 followers have liked the post, thanks to both the America’s Next Top Model and Fantastica stars’ huge following. This wasn’t the first time that Tyra has recognized Maymay on social media. The former was reported to have liked the latter’s photos from last year’s Star Magic Ball, as well as her runway walk for a fashion show by a local fashion brand.